Are you struggling to help your clients change their self-destructive behaviors? Today I want to share the role of Behavior Analysis. Behavioral Analysis (also called chain analysis or change analysis) is a tool used to understand what precedes and follows a behavior, usually called a “problem behavior” or “target behavior.” The more we understand about our behaviors, the more options we have for changing ineffective ones. It should be noted, though, that behavior analysis can be used to understand more about effective behaviors too: what helps to prompt them, and how the results of performing those behaviors differ from the consequences of target behaviors. Understanding more about our effective behaviors can lead us to strengthen them. Behavior analysis starts by identifying the specific target behavior. Examples might include drinking or getting high, self-injury, not participating in therapy, missing an appointment, not taking medications, or breaking a program rule. After the behavior is identified, the prompting event, or what triggered or set off the behavior, is described. Then, leading up to the prompting event, it is necessary to investigate what made you more vulnerable to acting on the target behavior in the first place. For example, did you experience poor sleep, miss medications, get into a fight, or leave open opportunities to engage in unskillful behavior? Once the target behavior, vulnerabilities, and the prompting event are well defined, you can begin to establish the links that bridge the prompting event to the target behavior. Potential links include emotions, thoughts, physical sensations, and other behaviors leading up to the target behavior. This step slows down the action so that you can see everything that comes between a prompting event and a behavior, building awareness of what is often missed unless explored in detail. The last part of the behavior analysis is identifying the consequences of the target behavior. Consequences involve the impacts of the behavior on you, on other people, and on the environment. Some consequences reinforce the target behavior while most other consequences are detrimental. It is also important to see whether certain consequences become vulnerabilities for future target behaviors. For example, if a consequence was feeling shame, that feeling could make one vulnerable to escaping that painful emotion through a target behavior such as self-injury. With the sequence from vulnerabilities through consequences established, you can then develop the solution analysis for each step, starting with skills to reduce vulnerabilities and ending with skills for dealing effectively with the consequences, including making appropriate amends with others by repairing mistakes and correcting whatever harm was done. As you or your client complete a behavior and solution analysis, remember to be nonjudgmental and accountable. The goal of this tool is to help your client apply these skills so they can be more effective next time. The following free video and worksheet download will show you how you can engage your clients, how you can help them understand what's behind these behaviors, and more importantly, how you can use this awareness to help them to change. Download the DBT Behavior Analysis Worksheet! 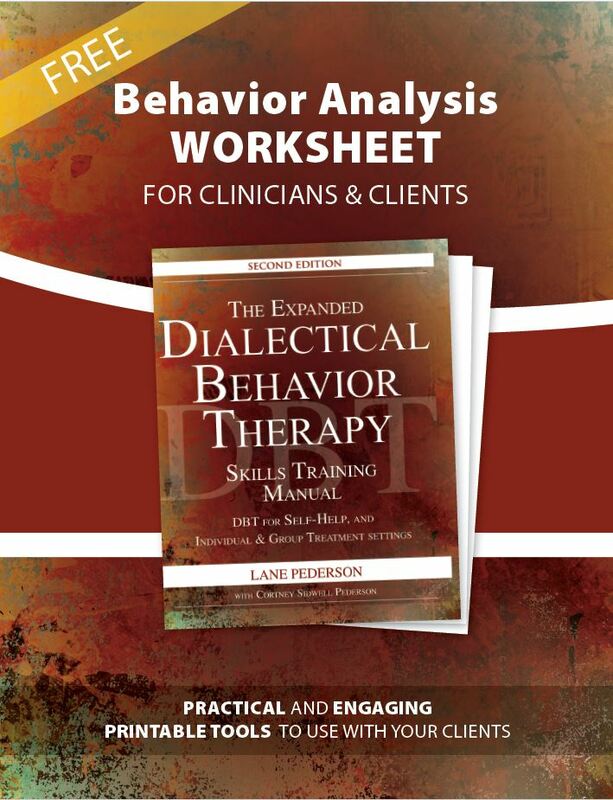 Dr. Pederson’s DBT publications include The Expanded Dialectical Behavior Therapy Skills Training Manual, Second Edition (PESI, 2017); Dialectical Behavior Therapy: A Contemporary Guide for Practitioners (Wiley, 2015); and Dialectical Behavior Therapy Skills Training in Integrated Dual Disorder Treatment Settings (PESI, 2013). YOU can be the therapist finally able to help them break through severe and chronic problems including personality disorders, self-destructive behaviors and more! By completing Dr. Pederson's 8-Week Intensive DBT Certificate Course available in a convenient online format, designed to fit seamlessly into your busy schedule. When you complete this intensive training, you'll be prepared to effectively apply proven DBT techniques and tools in your practice in a flexible way, specific to your client population, to improve treatment outcomes and your practice. Lock in your spot and begin transforming the lives of even your most difficult clients.